What's New For the 2019 Kia Optima? Kia has made quite a few upgrades for the 2019 Optima. This includes the number of features that come standard, including the Blind Spot Collision Warning and Rear Cross-Traffic Collision Warning. The UVO Link with navigation is new, too. It's standard on some trim levels and available on others. The engine has stayed the same, though the transmission has gone from CVT to a 6-speed automatic. As for the interior space and the overall exterior appearance, those remain the same from 2018 to 2019. The Kia Optima comes in four trim levels for 2019, including the LX, S, EX, and SX. The LX is the base model, offering a 2.4L engine, blind spot collision-avoidance assist, an 8" rear-camera display, and more. The S upgrades to 18" machined finish alloy wheels, smart key with push-button start, and a 10-way power-adjustable driver's seat. The EX provides a 1.6L turbocharged engine, leather seat trim, and smart cruise control. The SX has an even better engine, 18" gloss black alloy wheels, a panoramic sunroof, and more. 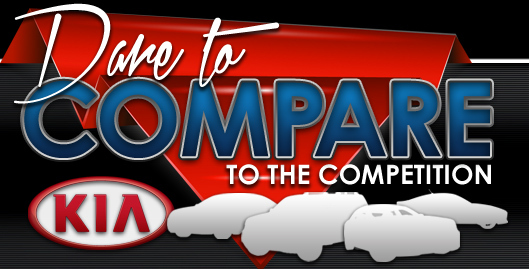 It's also important to note that the exterior colors available will vary based on the trim level that you choose. 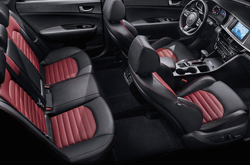 Passion Red, for example, is only available in the S and SX while Sangria is only found in the LX and EX trim levels. 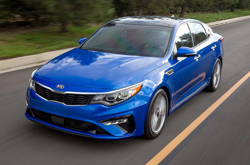 The 2019 Optima impresses with horsepower. It will vary based on the trim level that you get. For example, the LX offers a base 2.4L, 185 horsepower engine, which is the same for the S model. The EX gets an improved 1.6L turbocharged engine that offers 178 horsepower. Finally, the SX has a 2.0L turbocharged engine with 245 horsepower. 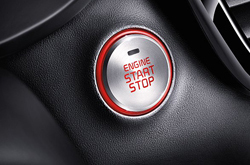 The engines of the Optima are certainly more powerful than other vehicles within its class. All of the trim levels provide a Sportmatic Sports Shifter, too, offering a sporty feel to the suspension as well as making cornering better than ever. 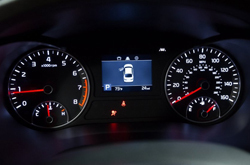 The Kia Optima is built for safety. All of the trim levels have the same features, too. This includes dual front advanced and front seat-mounted side airbags, driver's side knee airbag, anti-lock brakes, vehicle stability management, electronic stability control, tire pressure monitoring, and LATCH for children's car seats. Kia continues to win awards for its safety features. It won the IIHS Top Safety Pick + award for 2018 because of its list of features, particularly with its optional front crash prevention and LED headlights. Visit us at Joe Myers Kia today to take a test drive of the new 2019 Kia Optima. We look forward to showing you the details inside and out! Which New Kia Vehicles have Google Assistant?